I hate winter coat shopping. Going round every single shop and having to try on different colours, styles and sizes until I can find one that fits me like a glove. This year I was determined to find a coat that isn't like my previous ones, I don't want one of those baggy, parka coats I want something different. 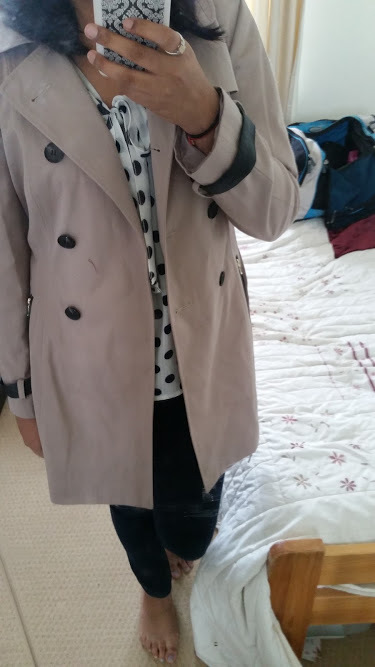 What this different style was I had no clue at first, then on a recent trip to Primark I managed to pick up this beauty of a trench coat. Never in my life have I owned one but see Victoria from IntheFrow wearing all the time, and she kind of persuaded me to buy one/try one. The colour is a subtle pink but yet neutral. The buttons and the strap around the waist is black plus as bonus has two pockets on the side. I AM IN LOVE. It goes with everything in my wardrobe everything from informal jeans to my posh going out dresses. I can't remember the price off the top of my head but it was around £15 which I think is completely reasonable. Do you love it or hate it?